It’s Sunday morning, and I’m cooking bacon for the children. It’s a snap. You line a big tray with parchment paper, and put the bacon on it. You pop it in the oven, turn the temp to 400 degrees, and walk away. 25 minutes later, you have bacon ready. It’s a cinch to clean up after. I know bacon is unhealthy, but it’s Sunday after all. One of the cool things you can do as a parent is to give to your children that which you didn’t have. My mother became sick when I was in 2nd grade, and thereafter, we had a succession of caretakers who shuffled in and out. I remember a lot of fast food and frozen food. I definitely don’t remember bacon on Sundays. So, for me, it’s very important that my children eat well. On most Christmas and Easter mornings, I will get up before sunrise to make from scratch some puffy and sugary cinnamon rolls. 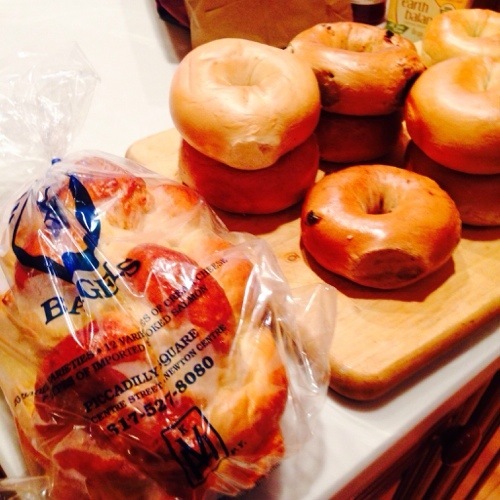 On some weekend mornings, I’ll make a run for bagels and challah. Today, I just returned with a pile of both (see photo up top). On Sundays, even when I’m tired, I will make a nice dinner. Tonight, it will be a Bolognese sauce, and also, a lobster fra diavolo, which two of my children especially like (wow, lobster prices have really fallen). It’s hard to explain, but as a parent, you definitely go out of your way. For me, call it an obsession if you’d like. But, there are worse habits to have. So, this morning, it’s about bacon and bagels. Try broiling bacon! The fat drips right off. Use a wire rack placed over a tin-foiled cookie sheet (easy clean-up) and place under the broiler for just 3-5 minutes and turn over for just 2 minutes more. Keep your eye on it as it can burn fast but it comes out nice and crispy. Add a touch of black pepper and it’s even better.